As a fusion of Chinese and Western cultures, Shanghai Xintiandi is an attraction with Shanghai's historical and cultural characteristics. Shanghai Xintiandi is based on the old building area of Shikumen in Shanghai. The old houses at Shikumen have been transformed into up-to-date restaurants, theaters, boutique shops and entertainment centers, etc. There, you can experience the modern life together with the retro atmosphere. Located at the heart of Shanghai and based on the unique Shikumen building in Shanghai, Xintiandi is a leisure pedestrian street integrating catering, business, entertainment and culture. There, you will find a combination of the traditional Shikumen buildings with modern building. 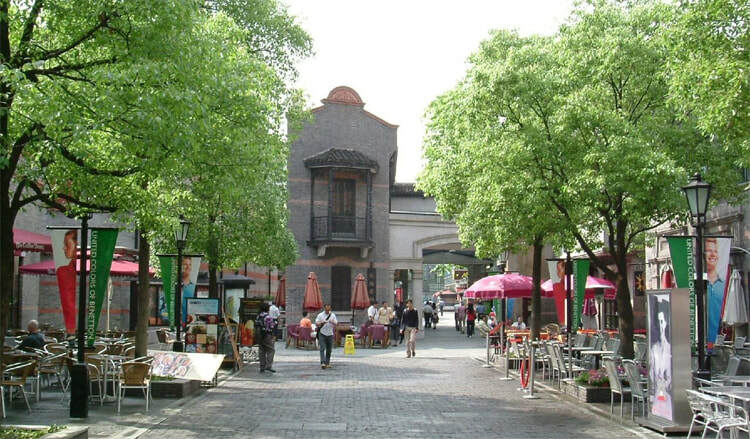 When walking around Xintiandi, you will feel that you are back into the Shanghai in the 1920s. You will find the Baroque façade of the buildings. While you enter the houses, you will be amazed at the modern decorations and styles. The European-style fireplace and sofa stand close to the Oriental Eight Immortals Table and the Taishi Chair in the house. Western restaurants, bars, cafes and the teahouses and the Chinese restaurants are harmoniously matched. In some shops, you can admire the modern oil paintings on the wall and the old-fashioned record player whixh shows the owner's cultural taste. Outside the door is a Shikumen alley with various styles while inside is a completely modern lifestyle. You can meet your stomach and your shopping desire at Xintiandi alongside the nostalgia thinking. Many fashion shows were regularly held at Xintiandi. In addition, you can enjoy art activities there if lucky enough. If you are planning to visit Xintiandi for photography purposes, the best time to visit is in the evening. The best months to visit Xintiandi are from March to November. There are a few buses passing Xintiandi. Therefore, there are a few options. Take Bus 911, 926 and Bus 42 to the Stop of Huangpi South Road (黄陂南路站). Take Metro Line 10 and Line 13 to the Stop of Xintiandi (新天地站). Please take care of your values at Xintiandi as there are many tourists there. Interested in visiting Xintiandi on a Tour? Wendy Wei Tours offers a variety of different packaged tours as well as custom tours including Xintiandi, among other attractions and destinations. To find out more, please visit our Tours page or Contact Us directly to find out more.